On the Create tab in the Classifications group, click Attribute. If you know the values for the attribute you can add them now. 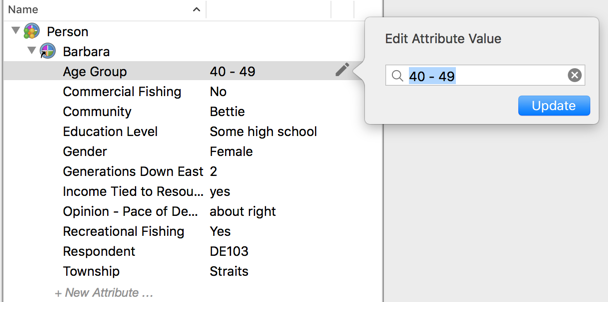 Click the plus sign at the bottom of the attributes panel. For example—for Gender, you could add Male and Female. In List View, right-click on the new cases, choose Classification and assign the cases to the classification you created. In Navigation View, click Case Classifications. Expand the classification and then expand the case. Click the pencil icon to update an attribute value. Click the magnifying glass to see the list of existing values or clear the value and enter a new one. In List View, select the focus group file. 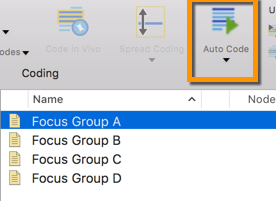 On the Analyze tab, in the Coding group, click Auto Code, and then choose By Speaker. 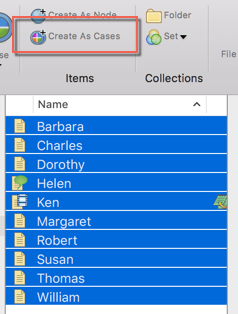 Enter the name of each speaker as identified in the selected file. The speaker is added to the list and you can see the number of references that will be coded. Choose a location for the newly created cases and assign them to a new or existing classification. 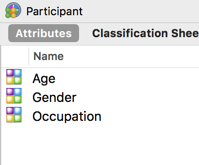 When you auto code by Username, the cases are assigned to the classification 'Facebook User', 'Twitter User' , and profile information about the user is stored as attribute values on the cases. In List View, select the social media dataset and then on the Analyze tab, in the Coding group, click Auto Code.